Appearance: Dark purple with a slight brownish tinge. Nose: Raisins, black currant jelly, plum, blueberry. Palate: Sweet and fruity. Blueberry jam, black cherry, bit of white pepper. Fades into a slight burn. Mixed: Yes, sometimes I mix my port, even when it’s not really Port. Made for a pretty bad Princeton cocktail, but that might have been down to the cheap gin I used. Did well with a squirt of lemon juice. Parting words: I purchased this bottle many years ago and planned to open it in 2018, but I jumped the gun a bit, as you can see. I’m glad I did. True Port, of course, has to come from Portugul, but this California version does a good job of being in the style but retaining its varietal characteristics. It has the toasty heat of a California Zin but has enough elegance and sweetness to pair well with dark chocolate or as a dessert in itself. The price is hard to beat too. 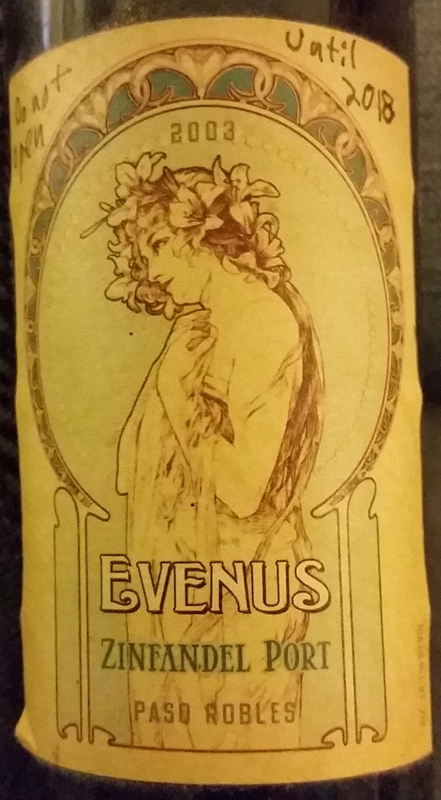 Evenus 2003 Zin Port is recommended.